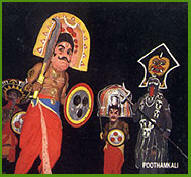 At some places in the district of Malappuram, Poothamkali is performed, especially by the dancers belonging to the Mannan community. The Mannans are basically washer men, but they do also practice indigenous medicine. Three dancers are required to present Poothamkali. They wear wooden masks made out of the wood of Pala and Muruku trees. These masks are also highly stylized and colorful. The dancers wear a right fitting sash and tie jingle bells (ghungroo) on their ankles. The dancer who represent Pootham has to undergo some austerities for seven days. It has also elements of theatre.